Here’s a little AC/DC to get you going - unplugged! The boys perch out on the couch and perform “You Shook Me All Night Long” live on air in Howard Stern’s studio way back in 2003. 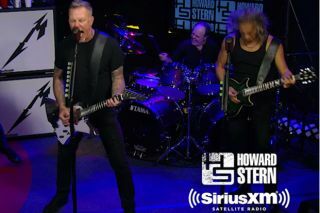 As we reported earlier today, Metallica visited New York City this weekend. They performed at the Apollo Theater on Saturday, at Yankee Stadium Sunday and in Howard Stern's radio studio this morning.